It is the weekend again and guess where I choose to spend my Saturday at? Oh, well the title was already a giveaway. 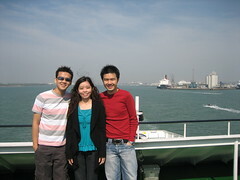 Myself, Eunice and Jin Siang whom are colleagues from work that I managed to convince to join me on the trip set off to the island in South of England. We departed from London Bridge at 7.30 a.m. on Anderson Tours coach and left London after the last pick up at about 9.00 a.m. in Earls Court. 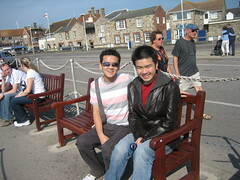 We arrived at Southampton whereby we took the Red Funnel ferry to Isle of Wight. The journey took us 55 minuntes before we arrived at Cowes. 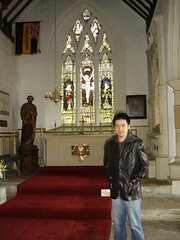 The first stop at the island was Godshill where there was a church on top of the hill. 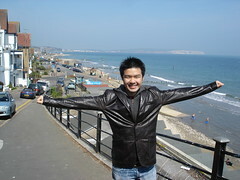 We soon made our way to Shanklin where there was the Chine and the beach. We had burgers for lunch here and spend just little over an hour. The beach was of reasonable English standards. The next stop was along the coastal road for a picture opportunity before heading to Yarmouth. I was dissapointed when I heard that I would not be able to go to the Needles at Isle of Wight but can understand the limitation of hours we have in the day. Oh well, to me it was a well day spent out of London. Please look at my flickr page for the pictures as I will update them on this post soon.